What a great way to enjoy quilting and visit beautiful islands in the Caribbean, Nassau, St. Thomas and St. Kitts and Nevis. How about a visit to the Batik Fabric Shop while in St. Kitts? How about making your own piece of fabric while you are there? Sound inviting? Heather has 3 great projects ready for you to sew. INCLUSIVE PRICING-PRICING IS SUBJECT TO CHANGE UNTIL BOOKED AND DEPOSITED! PRICING: Pricing is per person, based on double occupancy. Your fee includes the cruise cost, taxes, port fees, gratuities, all teacher fees, the use of a Janome sewing machine with mechanical support, and a complete project kit for all of the projects being taught on the trip. Once a deposit is made an insurance quote for the trip will be sent by email. If for any reason a quilter should cancel after the final payment has been made the cost of the quilting portion of the trip is non-refundable. Balcony- upon request. All balcony cabins in the group have been booked. $350 deposit is due at the time of registration. $100 is non-refundable. I've been sewing since my teens and quilting for more than 25 years. My first quilt was an Eleanor Burns Quilt in a Day. Since I had a king sized bed, it made sense to me to make a king sized quilt. Go big or go home, right? That quilt was in shades of mauve and dusty blue (hello mid '80's!) Let's just say my fabric tastes have changed since then! I consider myself a modern quilter, with traditional roots. I'm the founder of the Baltimore Modern Quilt Guild and love speaking to different groups and sharing the modern aesthetic. I'm foremost a teacher. I teach modern quilting classes in local shops, guilds and shows across the country. I'm a contributing author to the book Classic Modern Quilts and a featured quilter in The Improv Handbook for Modern Quilters by Sherri Lynn Wood. You can also find my work in Quiltmaker's 100 Blocks Magazine and Modern Patchwork Magazine. Let's connect! You can find me on my blog: www.heatherkojan.com or on Instagram @heatherkojan. HEATHER'S PROJECTS FOR THE QUILT AND CRUISE! Modern Improv Sampler: Ready to dip your toes into some improvisational piecing? Then this sampler is for you! Wonky stars, log cabins, 9 patches, etc - improvised but with detailed instruction. Make this for a little one in your life - or for yourself! 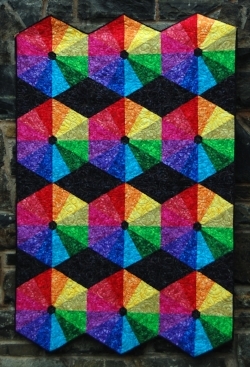 ROY: Make this vibrant hexagon quilt in a rainbow (ROY -g -biv) of colors. One column makes a table runner, 3 make a quilt! We'll learn to work with templates, 30 and 60 degree angles and a little English Paper Piecing to finish things off. Easy piecing - no Y seams! Perfect Project Bag: Need a quick gift? This sews up in just a few hours. Perfect for knitting, crochet, embroidery or any hand stitching project. It makes a cute gift bag too! Once you make one, you'll want to make many! Before You Board will help you prepare for your Cruise. More information will follow about your quilting tools. 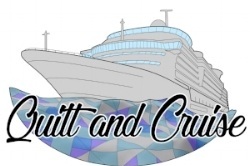 If you have any questions, please feel free to give Quilt and Cruise a call. Southwind Designs features original designs and patterns by Annette Ornelas, a German-born quilt artist, teacher and designer. Annette lives in Fayetteville, North Carolina, with her husband and their three dogs. Most of her time is devoted to teaching and designing, or spending time outdoors, enjoying her garden. She also loves riding along on her husband’s Harley and gets inspiration from looking at the scenery they pass. Annette conducts workshops and lectures throughout the United States. 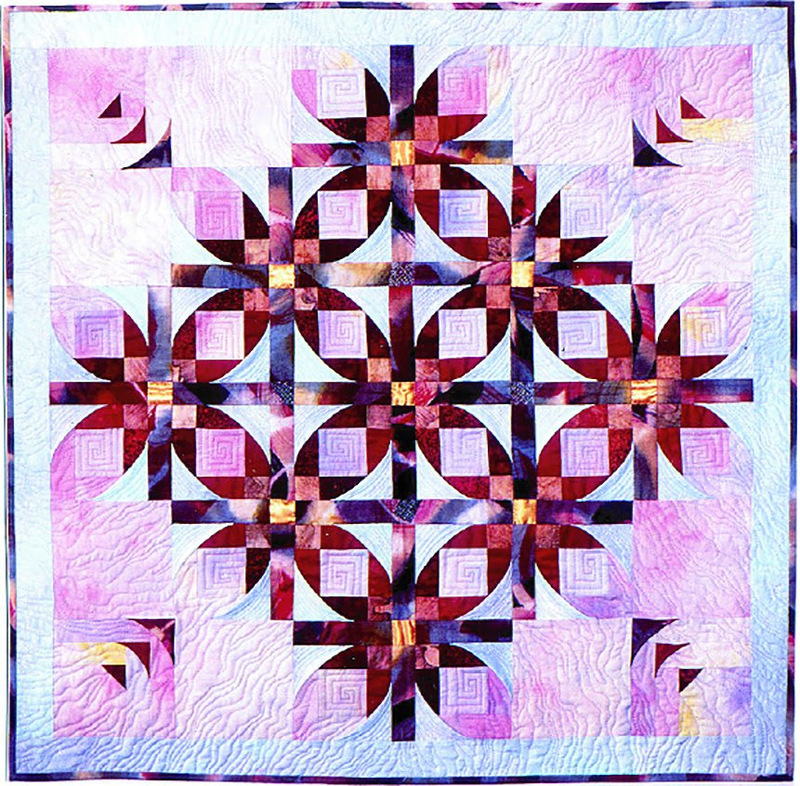 Her unique approach to quilting has led her to design numerous Dimensional Curved piecing patterns and books. Annette also enjoys making and teaching her unique free-form Textured Landscapes designs. INCLUSIVE PRICING:PRICING IS SUBJECT TO CHANGE UNTIL BOOKED AND DEPOSITED! Sherri began quilting over 30 years ago when a good friend signed them both up for beginner classes calling her on vacation to tell her they were going to learn how to quilt! That beginner class, all sewn by hand and cut with scissors, was repeated three times. Sherri stands by her story that it was all because they provided tea, cookies and free babysitting! When Sherri started teaching quilting classes, she began by taking the mystery out of the quilt making process and focused on mastering solid techniques so quilters would have confidence to complete the projects they wanted to, while keeping the emphasis on fun. As a joke to her students Sherri created a mystery project to keep them guessing and have fun with this mysterious quilting adventure. They loved the process and demanded more. So ironically, through her Border Creek Station Pattern Company, Sherri brought “mystery” and “fun” back together with the BCS Mystery Quilt Club. As one of the largest mystery quilt programs offered, Sherri designs an original quilt each year and has done so for the last 18 years. Sherri lives in a small ‘ghost-town’ village of Kilworthy in Ontario, Canada with her very supportive husband Ron (who works fulltime with Sherri including binding all of her quilts - he is a keeper!) and since their children have left the nest, they also keep busy with their two furry pals Jessie and Logan, both hunting dogs who love the outdoors and of course, cuddling with quilts. Sherri is working on something special for this trip. Sherry is planning 2 projects, one is a Mystery. This project uses mock up fabrics batiks in blues. The project is 71 x 81. Gudrun will be joining us for another Adventure at sea. She will be sharing her skills as a superior quilter. · Sewing machines provided by JANOME. GUDRUN ERLA WILL BE YOUR QUILTING INSTRUCTORS FOR YOUR TRIP. Gudrun has selected Marina for this cruise. But wait!!! She’s designing another pattern for our second project. PRICING: Pricing is per person, based on double occupancy. Your fee includes the cruise cost, taxes, port fees, gratuities, all teacher fees, and a complete project kit for all of the projects being taught on the trip. Once a deposit is made an insurance quote for the trip will be sent by email. If for any reason a quilter should cancel after the final payment has been made the cost of the quilting portion of the trip is non-refundable. $350 deposit is due at the time of registration. $100 is non-refundable and is applied to the quilting portion of the package. Vicki McCarty is a fabric and pattern designer, instructor and the owner of Calico Patch Quilt Shop...The home of Calico Patch Designs. Vicki learned to quilt from her grandmother over 40 years ago in the foothills of the Appalachian Mountains. In 1998, she began teaching quilting classes for the local Community Education and grew a small quilting community in eastern Kentucky. In 2000, she opened her quilt shop and continued to teach sewing, quilting and embroidery to hundreds of people. Her and her quilting husband Tom, are featured as a Top 10 Quilt shop in Better Homes & Gardens Fall 2018 Quilt Sampler Magazine and their project was featured on the front cover! Vicki designs quilts for classes, shop hops and quilting retreats. In 2015 she introduced her quilting patterns nationwide as Calico Patch Designs. She has since been lecturing and teaching at quilt shows and guilds across the country. Vicki’s designs have been published in American Quilter, Quilt Sampler, AQS's OnPoint magazine and the MODA Bakeshop. Vicki McCarty’s first fabric line with Marcus Fabrics, “Patches Of Joy” was introduced at the 2018 International Quilt Market and made available to shops in April 2019. It was inspired by her Calico Christmas Stitch-A-Long, which gained her social media attention on several Facebook Sewing groups. Her second line of fabric with Marcus will be released summer of 2019. Vicki loves to mix wool applique with traditional cotton antique blocks made with quick and practical methods. A lot of people end their day by reading before they go to bed but I try to end every day with a bit of hand stitching. Hand sewing is my first love. I always say it is “my therapy”. For me there is nothing more relaxing or calming. My hope is that I can pass on that passion through the classes that I teach all over the country. In class you will learn all aspects of wool applique including a short lecture on my wool dying process, felting, favorite tools, and finishing techniques. Several years ago my mother gave me a small, stained potholder with a little stamped kitten embroiderd on it. The stitches were irregular and long and did not completely cover the ink that made up the design. On the back of it though were my mother's perfect, even stitches that she had stitched Dawn 1967. I was almost 5 years old when I stitched that kitten. So when I say that I was stitching before I could write I really do mean it. I started sewing with a sewing machine in the second grade and the first thing I ever made was a long patchwork skirt with an EXTREMELY large ruffle along the bottom. (Something my children refer to as the flower child years). I know for certain that I probably wore that thing to school at least twice a week, mending it that often as well. Then one day it mysteriously disappeared before I could wear it to the 3rd grade. My mother denies to this day she had anything to do with the disappearance of my skirt. I started quilting in the mid 90’s and have never stopped since. 13 years ago my sister introduced me to the wonderful world of wool and I immediately fell in love with everything about wool. Now all of my designs have some wool component in them. I found that Crazy Quilting with wool was a wonderful way to combine my love of hand stitching and quilting. It also led to the development of our signature product, Crazy Stitches. A preprinted, water-soluble stitch guide. I live on Tablerock Lake outside of Branson, MO with my husband David, and two rotten dogs Elvis and Presley. We have three children and 11 grandchildren that are my pride and joy. Debbie Kalenty will be the featured Quilt Teacher on this awesome 9 night trip. Debbie will be bringing her Studio 180 expertise on board. Lots of fun and learning!! INCLUSIVE PRICING: PRICING IS SUBJECT TO CHANGE UNTIL BOOKED AND DEPOSITED! Hello, I’m Deborah “Debbie” Kalenty . I live in Central New Jersey (have lived here my entire life); I earned a Bachelors degree in Accounting and worked in Corporate America for many years. I have been quilting since 1989 (so almost 30 years), and have thoroughly enjoyed learning new tools and techniques along the way. As a stay at home Mom of 2 children (now grown), I decided I wanted to work ‘part time’ and still be home for my kids. So why not work in something that I enjoyed! I opened my online quilt store, www.QuiltersObsession.com in 2005. At first, it was only online, but then I began vending at area quilt shows. I discovered Deb Tucker’s Studio 180 Design tools and learned how much they improved my quilting skills. I became a Studio 180 Design Certified Instructor in March 2014. While I taught quilting classes before becoming Certified, I’ve taught much more regularly and on more subjects since. Over the last several years I’ve enjoyed traveling while lecturing, teaching, vending and designing my own patterns. I’ve had several patterns published in Fons & Porter’s Love of Quilting magazines. I’ve also had my quilts accepted into Nationally Judged quilt shows. I love teaching beginners or those who are new to our tools. As students see our improved techniques and the accuracy gained while using these tools, they get SO excited—-it is a joy for me to see! I look forward to meeting you on this cruise, and adding an enthusiastic spark to your quilting abilities! These two bright ones are “sisters” (a set). When you cut and piece the blocks in the left quilt, the left overs are used to make the quilt on the right . Debbie is going to share her quilting techniques to help you create these beautiful quilts! 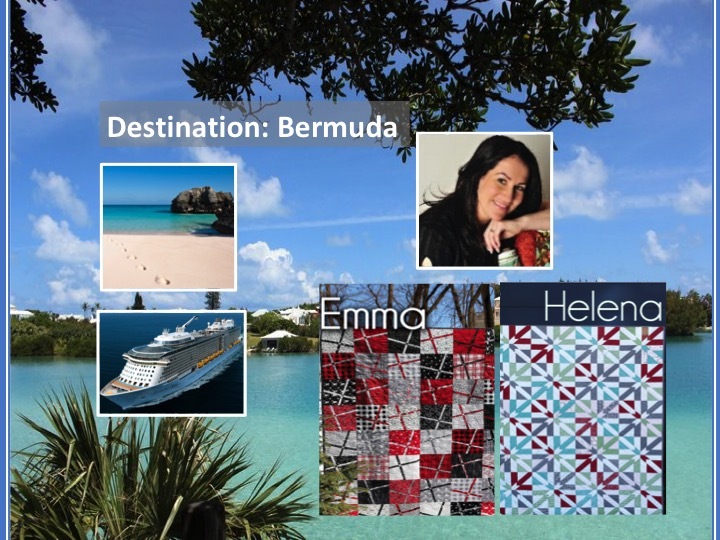 Anthem of the Seas 3 days of Quilting and a nice stay in Bermuda. Gudrun Erla, the designer and owner of GE Designs is born and raised in Iceland. She started quilting at the age of 23 and became totally addicted to it right away. After owning and running quilt shops in her home country and designing patterns along side it, a career move brought the family to Minnesota in 2003. Since then Gudrun has been designing full time, publishing patterns and books from her home office in Chanhassen, MN; where the family has been living since the move to the US. Gudrun loves everything quick and simple, so her quilts might look more complicated than they really are. She loves to find ways to do things quicker and use easier methods. 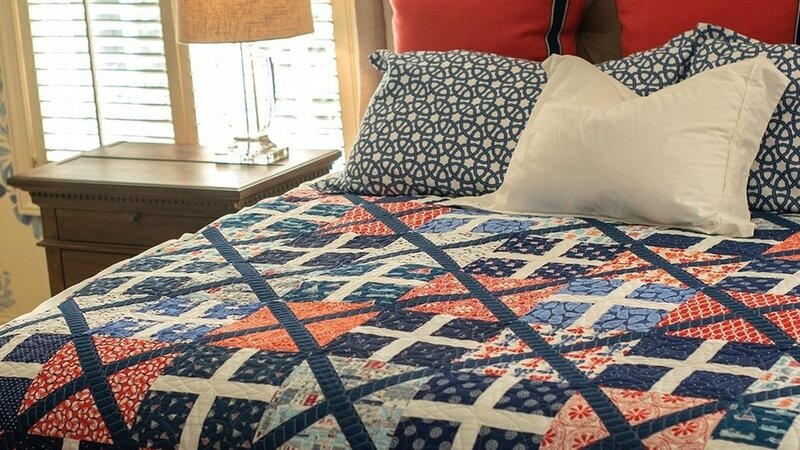 Her “quilt as you go” patterns have been very popular, with easy to follow instructions and quick assembly and finishing. All her patterns are geared toward today’s quilt makers, easy and fast with a modern touch. Gudrun has also been designing fabrics for Red Rooster Fabrics since 2006. This quilt uses assorted 10" squares and innovative piecing and cutting with the Stripology Squared ruler by GE Designs. The pattern comes with 6 different size options: crib, lap, twin, full, queen, king. 2018 PROJECTS JUST ANNOUNCED BY GUDRUN FOR OUR TRIP! THESE ARE BEAUTIFUL!!! This quilt uses assorted 10" squares of lights and darks as well as innovative piecing and cutting with the Stripology Squared ruler by GE Designs. The pattern comes with 5 different size options: crib, lap, twin, full, queen-king. Anthem of the Seas-November 10 to November 17, 2018 with Gudrun Erla. We will be in port for a nice length of time. Why not book one of Royal Caribbean's Shore Excursions and really get a true island expereince. Join us on the Allure of the Seas for a great time quilting and sailing. : Pricing is per person, based on double occupancy. Those traveling but not quilting may deduct $250 from the cost of the trip. These prices include everything but insurance. Once a deposit is made an insurance quote will be sent by email. All rooms are Central Park or Boardwalk Balcony. JOYCE HUGHES WILL BE YOUR QUILTING INSTRUCTOR FOR YOUR TRIP. Want to learn Dimensional Thread Painting but you think it is too hard. I often hear, “I am not creative and Can my Machine do this? etc., etc., Yes, You are Creative and Yes, you can do this on your Domestic Sewing Machine!! !In this class you will start with a Beautiful Panel to Create a piece of Art! You will learn the proper steps of Dimensional Thread Painting and find it to be a fun and creative technique. Explore the various thread selection, setting up your machine for stitching techniques with free motion quilting of zig zag and straight stitching, bobbin work and embellishing with netting and crystals. See the fabric come to life as you sew and layer the threads on top of your design. You will use Thread as Paint –sew with different types of threads and color combinations. Learn how to create interesting texture and dimension to your quilting project. You will leave with a full knowledge of Dimensional Thread Painting and create a One of Kind piece of Art! YOUR QUILTING PROJECTS-Joyce may add another project. Allure of the Seas-April 15 until April 22, 2018 with Joyce Hughes. Take a look at the Shore Excursions for your trip. These excursions are offered by Royal Caribbean.